Better late than never, right? Well, after a long month focusing on work (both my real day job and my budding photography side gig), I'm finally back to offer the second part of my You Are Golden mini-kit! 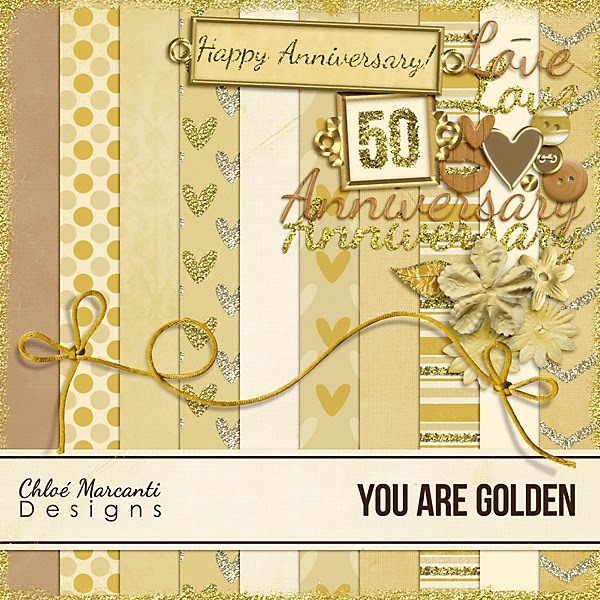 I created it with golden anniversaries in mind. Click here to download part 2 of this mini kit for free! The first part should still be availble here. I hope you enjoy this freebie and you'll live a comment to let me know you do! Oh, and of course, if you scrap with it, I'd love to see your creations! Subscribe or visit again soon for another mini-kit, this one focused on Silver anniversaries (25 years of marriage, still pretty impressive if you ask me!)! PS: Thanks to all of you who expressed concerns about my little hospital stay. It was a planned surgery, nothing serious, and everything went great. I'm like new now! LOL Thanks again for your sweet words! Thank you for this beautiful kit!! This kit is beautiful! Thank you!! I love this, will be great for a golden wedding anniversary that's coming up. Thank you! Ahh part 2 is here, yippee! Thank you for this lovely kit. Thanks so much for this beautiful kit! Thank you so much! This is exactly what I needed to scrap my in-law's 50th anniversary party.